As mentioned, I’ve been drooling over ChiLantro’s menu for quite a while before actually getting a chance to finally try it. I went again this weekend and was reminded I haven’t quite blogged about it. I actually look forward to hitting up this trailer a little more than the actual going out downtown. It’s that good. So when Alan told me we were going out with his friends downtown Saturday, I salivated all day in anticipation for this Korean/Mexican fusion. What a genius idea (which has been credited to have been originated in LA) putting Korean bbq (bulgogi) in tortillas! Why not right? 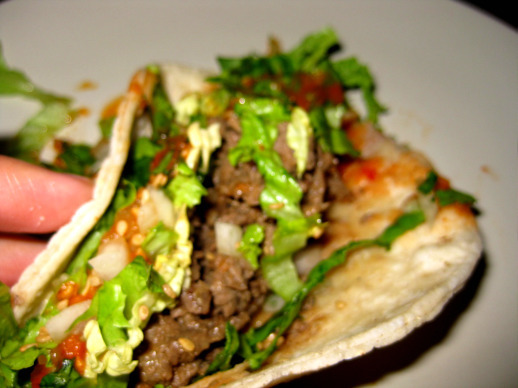 I’ve had bulgogi burgers years ago, why did it take so long for the advent of bulgogi tacos?! I’m straying from the point though. 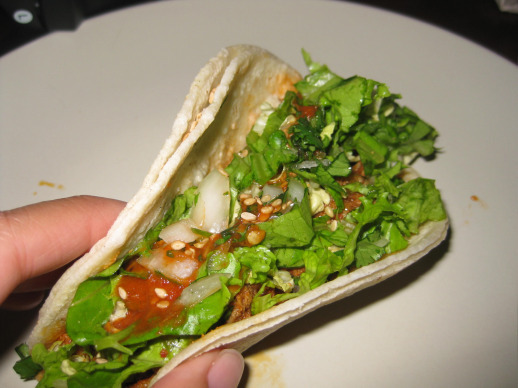 The point is, bulgogi tacos are here now and in Austin, they come via ChiLantro’s traveling trailer. Sadly, their locations are not UT friendly during the weekdays so for now, it’s a going out downtown treat for me. Their website has promised that in August, they will be gracing the university with their satisfying presence. Alan treated me to pork, beef, and chicken tacos my first time. Tacos are priced at $2 each. They also have burgers, quesadillas, burritos. I do plan on trying more of their menus but for now, the tacos have me enamored. Alan, a Korean who is a disappointed with the quality of Korean food in Austin, is thoroughly impressed with the flavors of ChiLantro. I myself (my experience has been limited to mostly Austin, TX and one amazing place in Flushing, NY), have to agree that the bulgogi of ChiLantro is impeccable. Meats are tender, not too fatty, and absolutely flavorful. Can’t wait to go to ChiLantro again :). Happy surprise! I ran into Peter Tsai, of TheTastingBuds.com during my second trip on Saturday!